You know what they say about lies. You need a good memory to keep your story in check. Matt could have used that, and more, during the height of the Mike Murdock madness. Below is a scene from Daredevil #35, by Stan Lee and Gene Colan, which sees Matt caught in his own web of lies. Not only does his story raise more questions than it answers, he comes across as uncaring and indifferent to his “brother’s” safety. 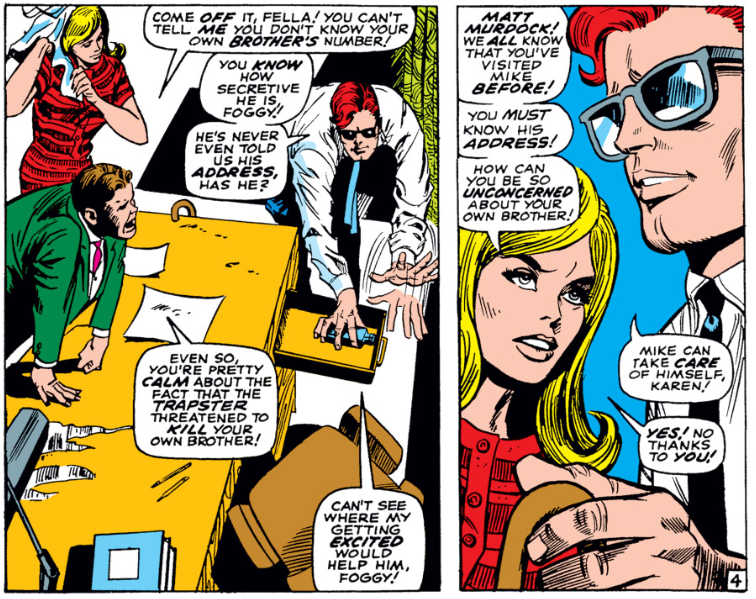 What has happened here is that the Trapster, a villain in possession of a strange sticky gum rifle, has descended on the law office, immobilizing Foggy and Karen. Matt, being blind, isn’t considered a threat and is spared the sticky gum treatment. While it’s not vital to what happens next, I should add that the reason the Trapster went to all this trouble was to obtain legal advice. Yeah. So, Matt is trying to pull the “my brother is so secretive” routine again, claiming not to know Mike’s phone number or address. Karen claims to know that Matt has in fact been to his brother’s place so his excuses are starting to sound a little thin. A question I’d like to ask is why Matt doesn’t just fake call his brother and pretend to warn him. 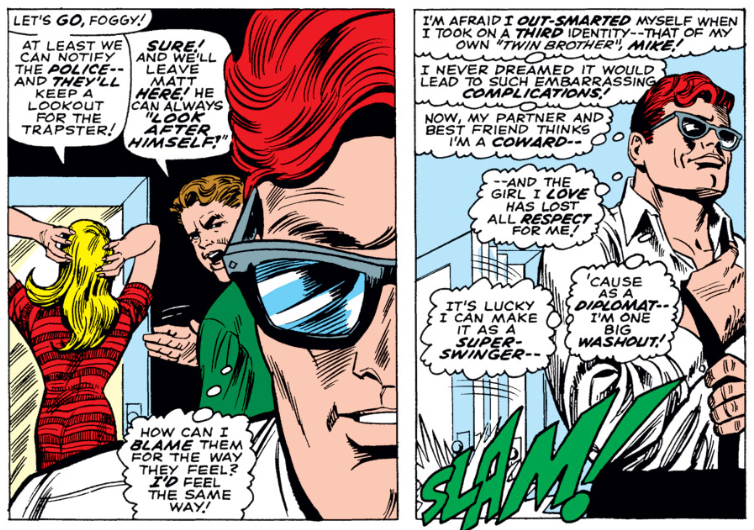 “I never dreamed [pretending to be my own sighted, super-secretive, twin brother (whose first name is my middle name) who I also pretend is Daredevil] would lead to such embarrassing complications!” Yes, Matt, who could have predicted that would be trouble? Hey! I just discovered this blog, and I wanted to thank you for putting it together. 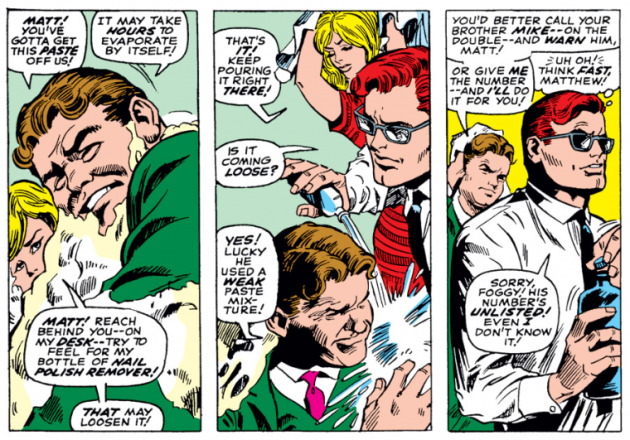 I’ve been going through looking at the TPBs, and the silver age insanity, and I’m amazed at how much research and care go into all of this. (I wish I had found that sooner. I eventually went on a spree, hunting down the single issues, because the omnibi were so confusing.) I don’t collect a lot of comics, but DD is pretty close to my heart. It’s nice to see someone else with so much passion for the character.